A lot of chaps want it although it can be downloaded for free by clicking on the top title above. One of those books people get worked up about, for some its Wuthering Heights, for some its Lazy Liza Lizard and for others it's clustering data. Anil Jain is well known and respected in the field of facial and dental recognition, fingerprints and signature authentication. We're also talking data mining...our pic below is from an algorithm watchers site. He has a website devoted to him where his research interests are listed as 'statistical pattern recognition, data clustering, texture analysis, document image understanding and biometric authentication.' In the post 9/11 world such areas of knowlege are inreasingly relevant and lucrative. 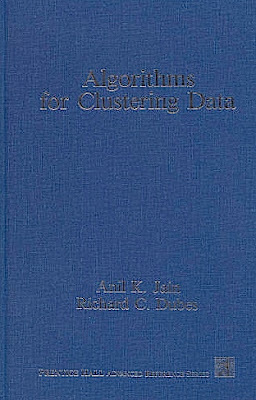 The book 'Algorithms for Clustering Data' is noted as being ranked by Citeseer as # 93 in Most Cited Articles in Computer Science (over all times). I don't know if you noticed but it can be downloaded (in less than a minute) for free. It is nice to have the actual book, however, but at this price it is not alot of fun or may be algorithms are such good business that $500 is chump change.